Felix Analyze provides a comprehensive set of industry leading analytics service. From real-time streaming analytics and machine-learning to big data analysis capabilities, Felix Analyze has it all. The sheer volume of information and the pace at which it is being delivered presents a unique challenge to the successful delivery of an IoT solution. Coupled with the demand for a deeper understanding of this information and how it might be applied to drive tangible business value, the need for flexible and efficient analysis of IoT information is ever-growing. Felix Analyze provides the services necessary to handle the enormous amount of data IoT generates and efficiently deliver the insights that will accelerate a competitive advantage in any industry. With our real-time analytics engine build analytic pipelines to analyze thousands of data stream simultaneously. Monitor and control IoT enabled business processes in real-time. Easily add new analytic functions to get the valuable insight into operations needed to succeed. Felix has the ability to learn how a business processes normally functions and can automatically alert if any deviation from this norm is detected. Our machine learning capabilities greatly reduce the amount of manual configuration needed to IoT enable any business. Not all insights will be gained in real-time. Some conclusions can only be reached by analyzing vast amounts of information gathered over long periods of time. Felix big data analytics provides all the capability necessary to fully understand and optimize any business. 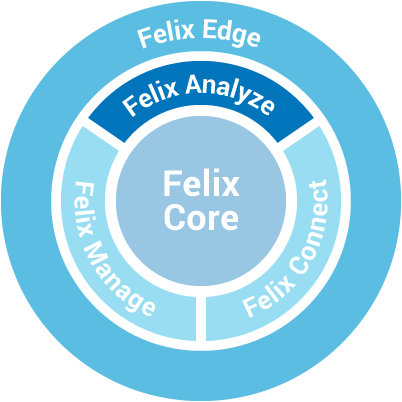 Felix Analyze provides a comprehensive set of analytic capabilities, from real-time to machine learning and big data, batch analysis. All the analytics necessary to get real value from investment in an IoT solution. Felix Analyze is not an all-or-nothing decision. Use only the features necessary. Use it as a shared service, hosted on a private cloud or deployed locally. Felix Analyze has been architected to easily adapt to any environment. Felix Analyze is capable of handling the most demanding loads. Horizontally scalable, Felix Analyze can dynamically scale to ensure analytic results are available when they are needed.